Despite the inclement weather, kudos to the Trail Patrol Wardens who braved the elements to carry out their volunteer duties. 1. A tiny, on leash dog, was visibly afraid when approached by a large, aggressive on leash, barking dog. For their dog’s safety, the owners of the tiny dog left the Park. 2. As a result of the recent cold weather, the door to the outhouse has warped and therefore is difficult to close. 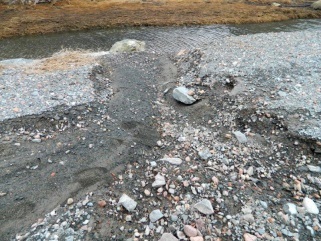 A rock is now being used on the outside to keep it closed. With a little effort, it can be closed from the inside. Our maintenance volunteers will adjust the door once the weather improves. 3. A frequent trail walker continues to deposit bird seed along the Costley Farm Trail. She has been doing this for some years now. The cold and nasty weather has not prevented her from feeding the birds and squirrels. 4. 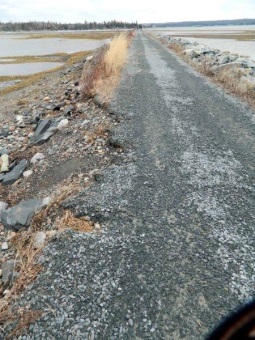 The in-ground trail counter was removed for the winter months. This counter tallies the use of bicycles on the trail. The “people” counter is above ground and can remain outside year round. 5. 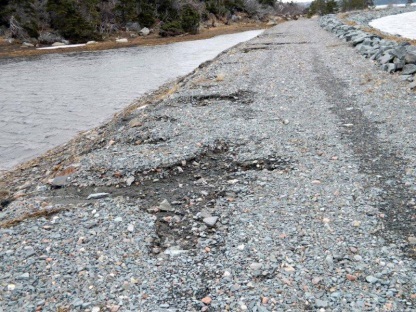 Storm damage between the Canada Goose and Ready Aye Ready bridges has been reported to the CHPTA Maintenance Chair. 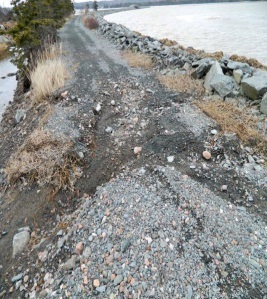 Repairs will be conducted once funding is available and weather permits. 6. Duck hunters, in boats, were seen near the Trail. Hopefully, they are being careful as to where they aim their shotguns! 7. Household garbage continues to be dumped at the Caldwell Road Parking Lot site. As well, birds and animals continue to rummage in the garbage can, which results in garbage being strewn on the ground. 8. 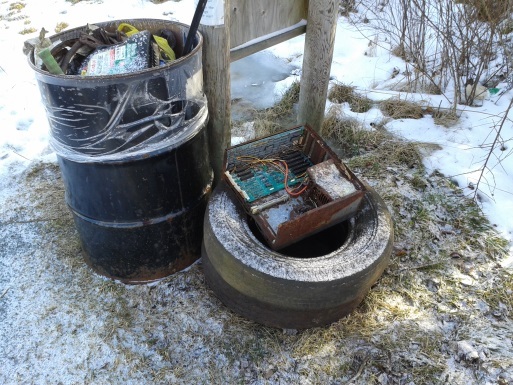 Someone continues to deposit household garbage around the Caldwell Road trail head garbage can. Tires and computer parts appear to be the flavour of the day! 9. A Trail Patrol Warden spoke to two off leash dog owners about the on leash regulation but they ignored his comments and continued along their way. One owner said he always leashed his dog whenever he sees others on the trail but did nothing when his large dog approached and circled the Warden. The other off leash dog owner kept tossing a stick and a ball to his German shepherd dog. Both owners had leashes hanging on their shoulders. 10. 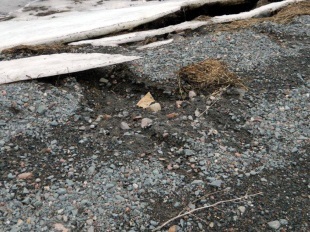 ATV damage continues to take place on the trail. 11. 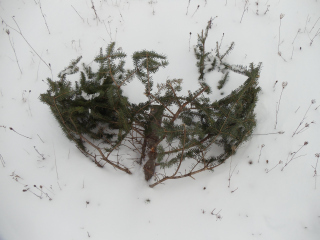 Two Christmas trees were deposited by the Caldwell Road parking lot fence. One appeared to be the bottom piece of a Christmas tree. Perhaps it may have been from a tree cut along the edge of the trail. 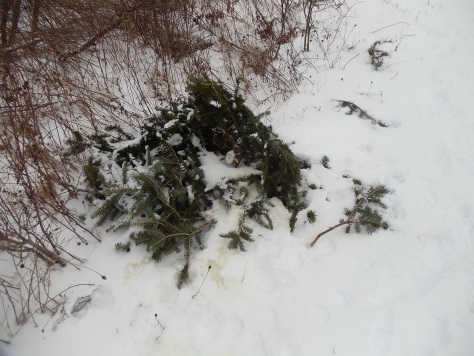 A Trail Patrol Warden had previously been asked where on the Trails was a good place to cut trees for Christmas. 12. A CHPTA volunteer replaced the 5 km distance sign which had been beaten off the post by vandals. 13. 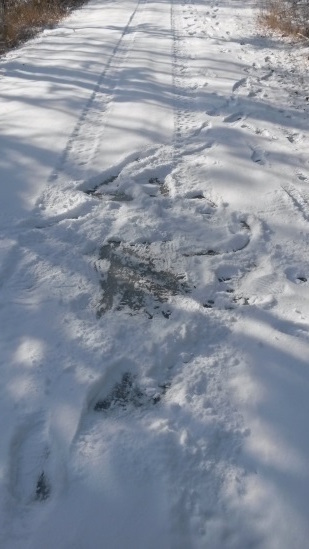 An irate trail walker complained to a Trail Patrol Warden about the number of off leash dogs on the trails and the amount of dog feces not being picked up. This walker lives adjacent to the Trail and is considering erecting a sign asking her neighbours to clean-up after their dogs. 14. Trail maps were given to a visiting Lower Sackville geocacher who was checking our trails for geocache sites. 15. 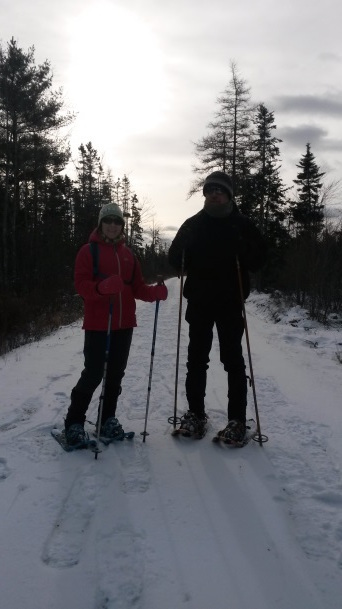 On several occasions, cross country skiers and snowshoers have been seen on several of our trails. 16. 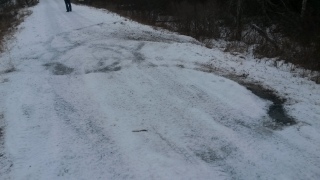 The freezing ice storms have created very trecherous walking conditiions on many of the trails. Ice grippers on footware is a necessity on the trails. Opps, did someone fall here? 17. 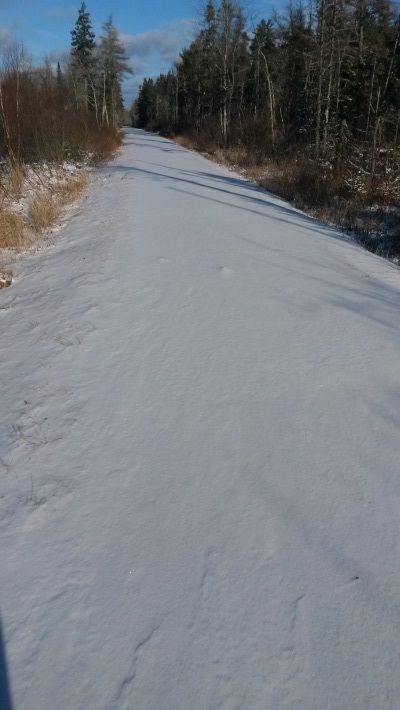 Despite many of the trails being snow and ice covered, cyclists continue to ride our trails during these winter conditions. 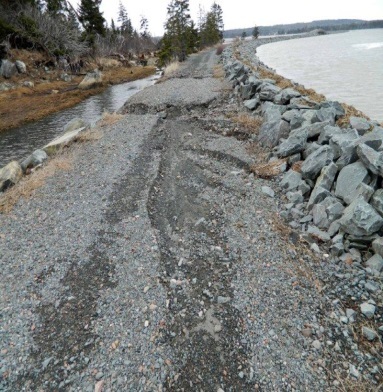 One Warden patrolled 95km of the trail on bicycle. 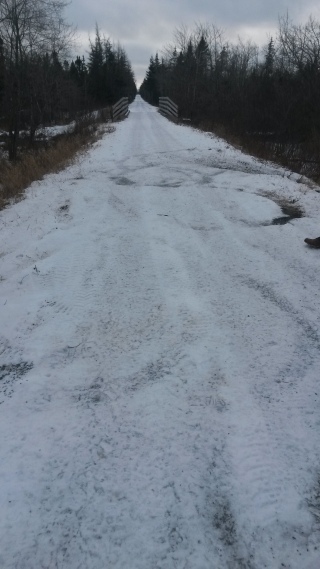 Several cyclists have equipped their bicycles with studded tires and indicated they have had no trouble travelling on the ice covered trails. American Goldfinches, Artic Tern, Bald Eagles, Blue Jays, Buffleheads, Black Capped Chickadees, Canada Geese, Chipmunks, Common Goldeneye, Coyote, Crows, Downy Woodpeckers (male & female), Herring Gulls, Common Mergansers, Mink, Muskrats, Otter, Pheasant, Porcupine, Rabbit, Sea Gulls, Starlings, Squirrels, Various Duck species (Black & Mallards) and White Tailed Deer. 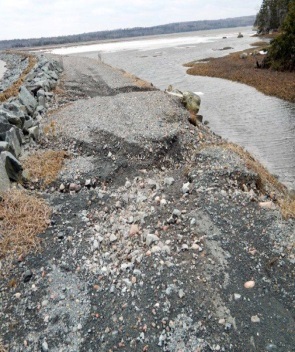 There were several sightings of a Snowy Owl in the Lawrencetown area.